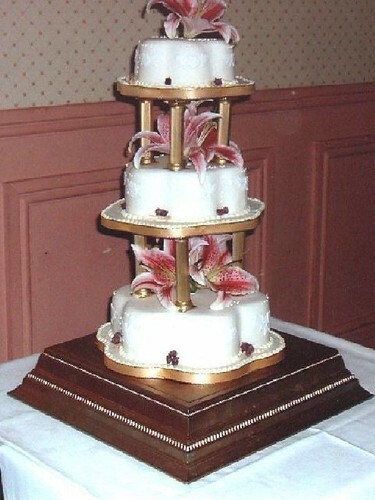 3 tiered wedding cake with a number of lillies as decoration. Single tier wedding cake with lillies on top. 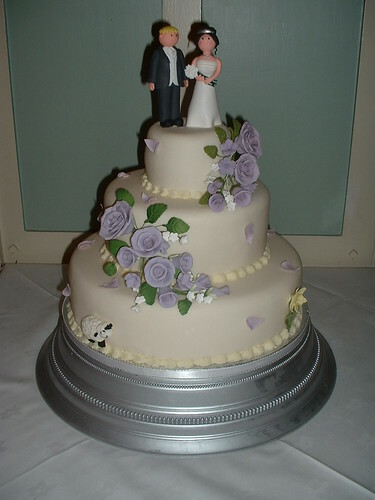 3 tiered wedding cake with lilac roses and pre-made bride and groom wedding topper. 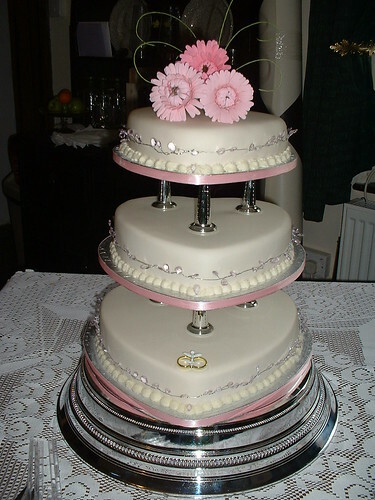 3 tier wedding cake with heart shaped cakes and detailed pink flowers on top. 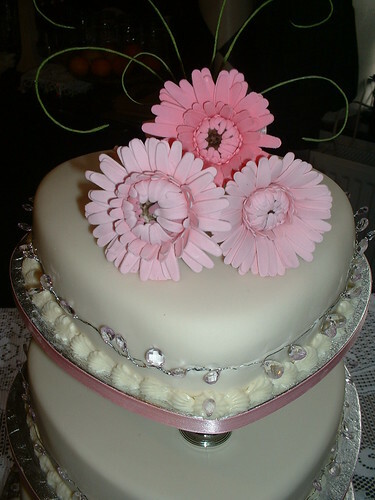 Top tier of wedding cake showing the detail of the pink flower topper and the icing around the base of the cake. 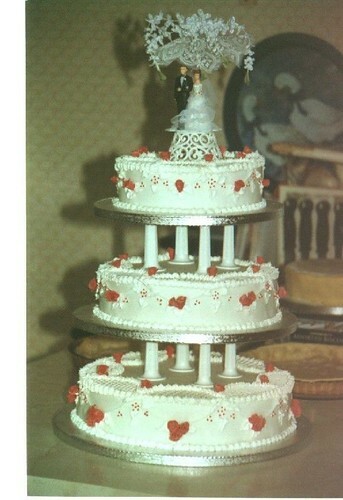 3 tiered wedding cake with red roses and a Willow Tree topper. 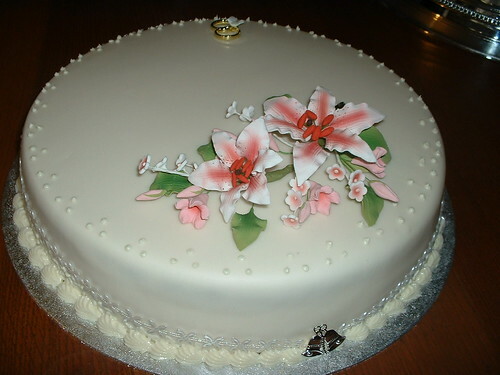 Top tier of a wedding cake with detailed flower and ring topper. 3 tiered wedding cake with a large number of handmade roses and a bride and groom topper. 2 tiered wedding cake with pink and blue theme and a selection of handmade flowers. 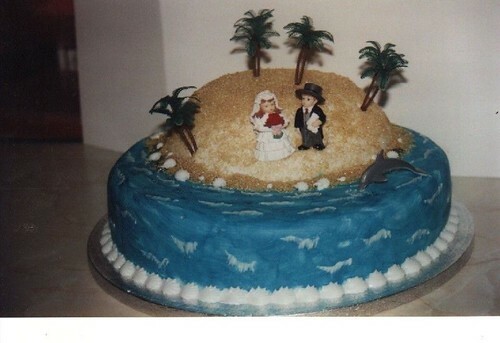 Desert island themed wedding cake with bride and groom topper. 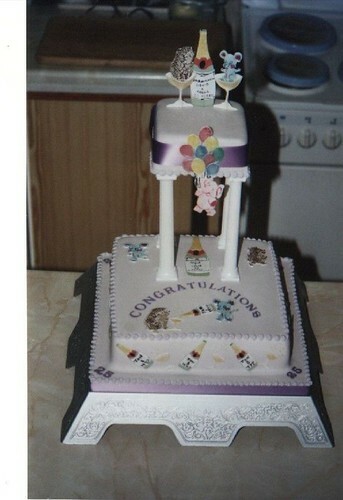 2 tiered wedding cake with party and champagne theme. 3 tiered wedding cake with large, handmade flowers and a custom stand for off centre presentation. 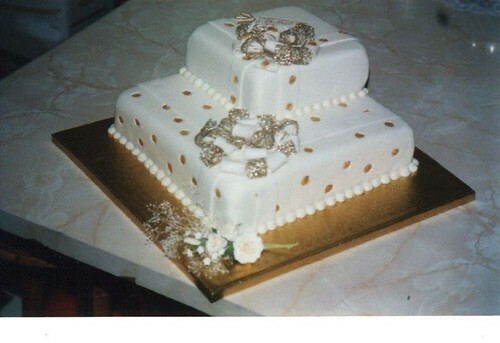 2 tiered, off centre wedding cake with gold and white theme and ribbon-style icing decoration. 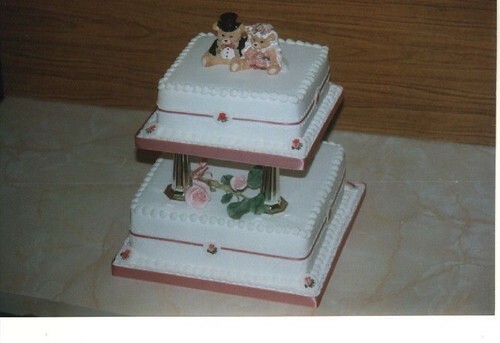 Simple 2 tiered wedding cake with elegant design and a ceramic teddy bear bride and groom. 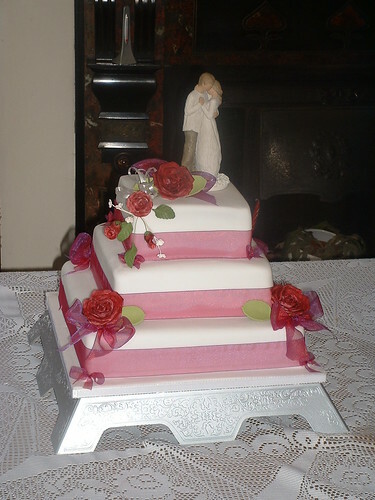 3 tiered heart shaped wedding cake with a number of handmade icing roses and ribbons. 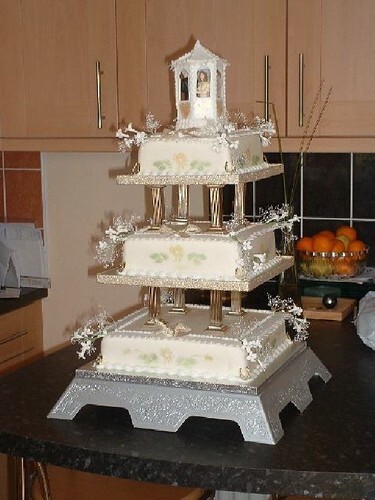 3 tiered wedding cake with Me to You bride and groom and a selection of flowers. 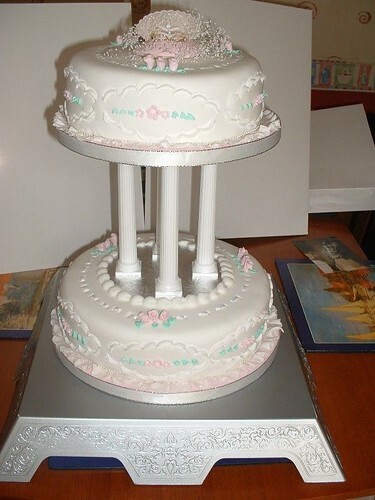 3 tiered wedding cake with bridge and groom topper inside a handmade gazebo. The cake also features pillars between tiers and a number of handmade flowers. 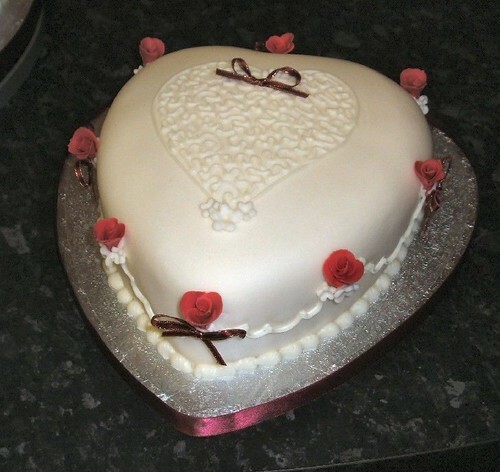 Heart shaped wedding cake with intricate piping detail, handmade roses and a bow as decoration. 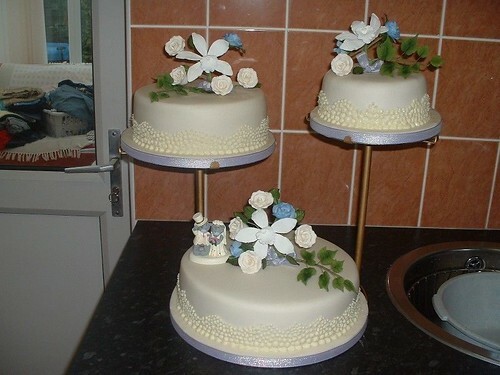 3 tiered wedding cake with unusual petal shaped cakes. 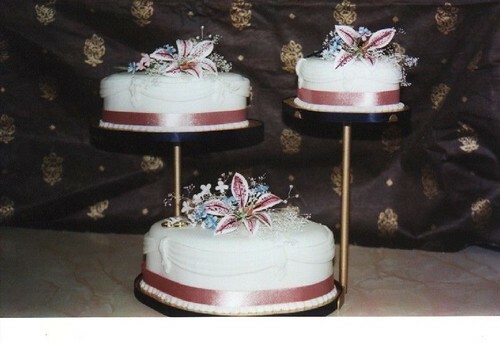 The cake also uses pillars between tiers and a number of handmade, custom flowers. 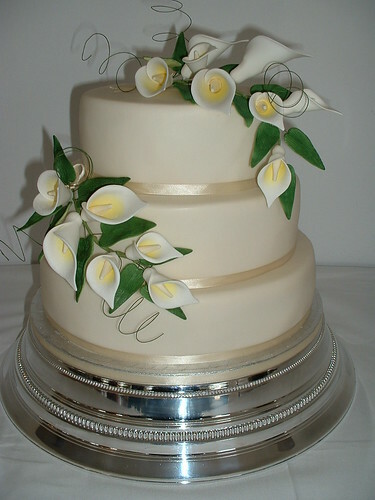 3 tiered ivory wedding cake with plain decoration and simple Lilies as decoration. 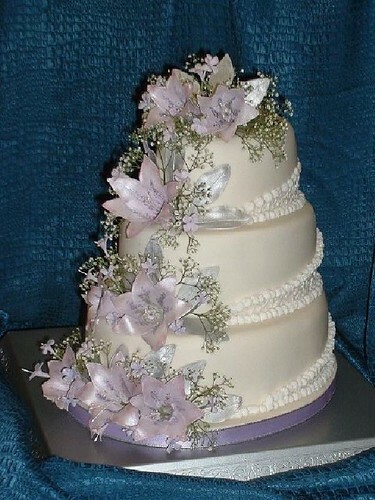 3 tiered oval wedding cake with lilac flowers as decoration. 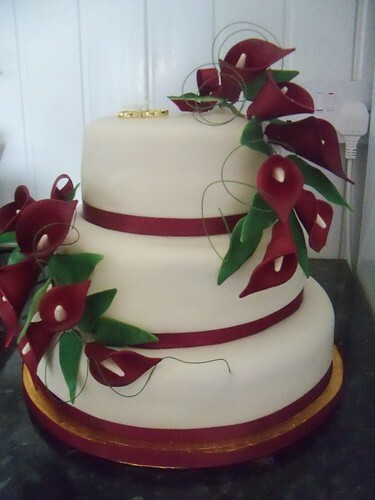 3 tiered round wedding cake with intricate piping detail and rose petals handmade from icing. Your wedding day is one of the most important days in your life and your wedding cake is likely to be the most expensive cake you ever buy. Therefore you want to get it right. Fortunately, so do we. In addition to the gallery we have a number of wedding cake books and magazines available to ensure we design and create the cake that you want. 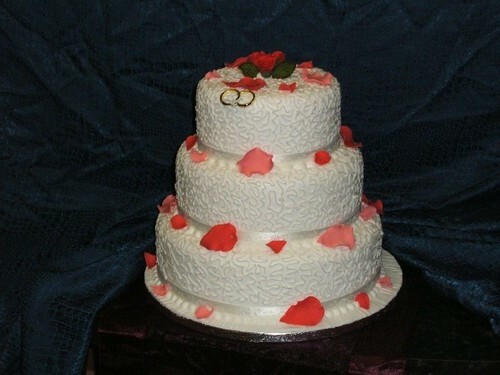 As every wedding cake is different we don't have a set price list for weddings. 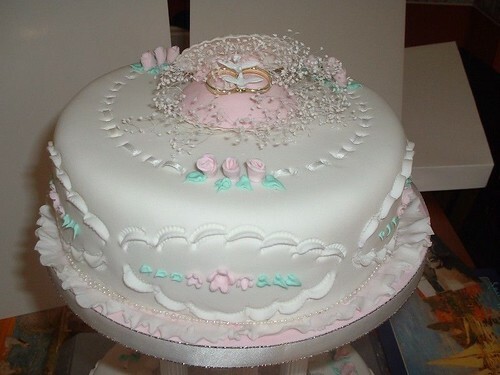 However, our prices start at £200.00 for three tiers and we are happy to provide quotes for cakes with any number of tiers, smaller or larger. 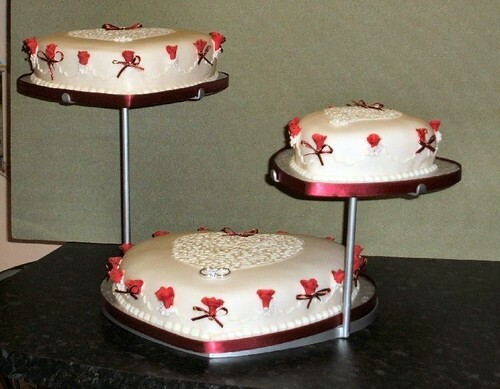 We believe that it's possible to have a cheap wedding cake that isn't cheap on quality. 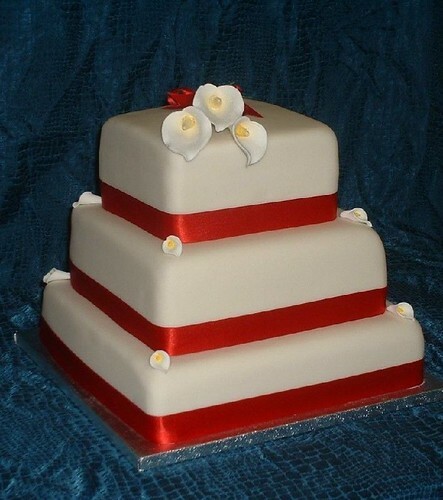 Even though we provide cheaper wedding cakes than many other wedding cake makers we promise not to cut the quality and our customers have always been more than satisfied with our wedding cakes.